SEOUL (Yonhap) – South Korea and Uzbekistan agreed Tuesday to expand cooperation in military education and personnel exchange. A family of South Korean supersonic advanced trainers and multirole light fighters, developed by the consortium established by Korea Aerospace Industries (KAI) with the Lockheed Martin. The T-50 is South Korea’s first indigenous supersonic aircraft and one of the world’s few supersonic trainers. Development began in the late 1990s, and its maiden flight occurred in 2002. The aircraft entered active service with the Republic of Korea Air Force in 2005. South Korean Defence Minister Han Min-koo and his Uzbek counterpart, Kabul Berdiev, signed the memorandum of understanding (MoU) on promoting bilateral partnerships following their talks here, according to Seoul’s defence ministry. “The MoU aims to promote the exchange among the two nations’ service personnel and military students through which the two sides are expected to share military-related know-how and deepen relations”, a ministry spokesman said. During the talks, the ministers also discussed a wide range of issues of mutual interest, including the regional security situation. Berdiev arrived in Seoul on Monday for a five-day visit – the first trip by the Central Asian country’s top defence official to South Korea in seven years. While staying here, he plans to visit major defence firms to seek cooperation. South Korea has recently strengthened defence ties with Peru and Colombia as part of efforts to boost its presence in international military export markets. Defence collaboration between South Korea, Peru, and Colombia was the focus of talks during South Korean President Park Geun-hye’s visit to South America on 20 April. 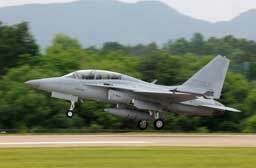 South Korea has offered the Korea Aerospace Industries (KAI) FA-50 Golden Eagle light fighter aircraft to Peru, and Park indicated during her visit to Lima that any sale would be accompanied by technology transfers.